"Calcareous nannoplankton from the Brockenhurst Bed of Whitecliff Bay, Isle of Wight, belong to zone NP 20 of the standard Palaeogene calcareous nannoplankton zonation, indicating that the stratigraphic position of the Brockenhurst Bed is in the uppermost Eocene, and not equivalent to the type Lattorfian (Lower Oligocene)." "By the northward movement of India the Tethys Ocean vanished. The western end of the relic Tethys connected the Indo-Pacific and the Atlantic Ocean. Northward the Turgai Strait opened to the Polar Sea, and hindered an intracontinental mammal migration. 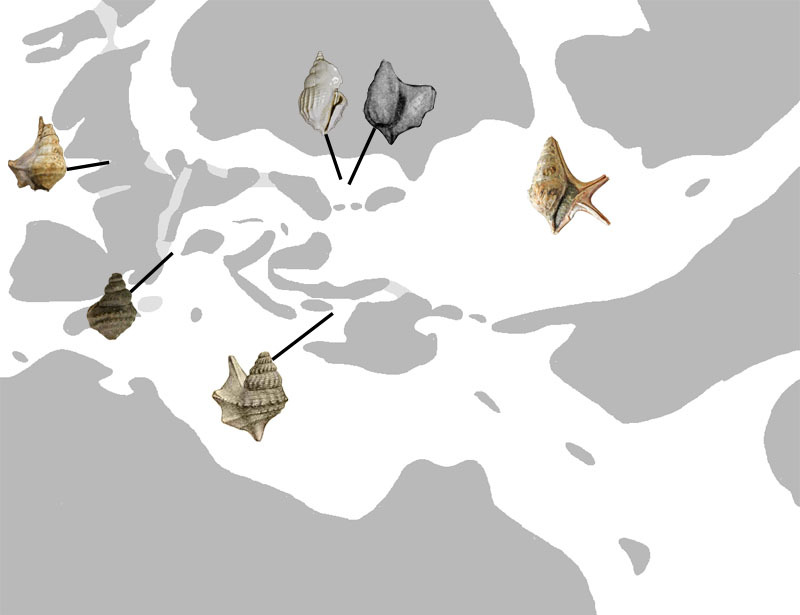 Europe was still an archipelago in the Eocene." Daley, B., 1999. Palaeogene sections on the Isle of Wight. A revision of their description and significance in the light of research undertaken over recent decades. In: Tertiary Research. Band 19, 1999, S. 1�69. Etheridge, R. 1883. Address of the President of Section C - Geology. Report of the British Association for the Advancement of Science, 52nd Meeting at Southampton in August, 1882. Transactions of Section C, pp. 502-529. By Robert Etheridge, F.R.S.L. and E., F.G.S., Assistant Keeper of the Geological and Palaeontological Department of the Natural History Museum (British Museum), London. Insole, A. & Daley, B.: A revision of the lithostratigraphical nomenclature of the Late Eocene and Early Oligocene strata of the Hampshire Basin, southern England. In: Tertiary Research. Band 7, 1985, S. 67�100. Martini, E., 1970. The Upper Eocene Brockenhurst Bed; Geological Magazine 107(03): 225-228. F. R�gl, 1999. Mediterranean and Paratethys. Facts and Hypothesis of an Oligocene to Miocene Paleogeography (Short Overview); Geologica Carpathica 50(4), 339-349.